Don’t study books about the Bible, study the Bible. In college I was excited to take a class on C.S. Lewis. My enthusiasm, however, didn’t last long. I wrongly assumed we would study the writings of Lewis. Instead we focused on what scholars said about what he wrote. Yes, we did read one of C.S. Lewis’s books in the class, but the rest of the syllabus had us merely examining books about him. My interaction with Lewis was filtered through intermediaries. This approach disappointed me. It left me frustrated. With so much we could have learned, we were diverted to secondary sources. Many people wrongly take this same approach with the Bible. Instead of reading the Bible, they read books about the Bible. Instead of studying the Word of God, they study what scholars say about it. What if the experts are wrong? What if our authoritarian sources lead us astray? 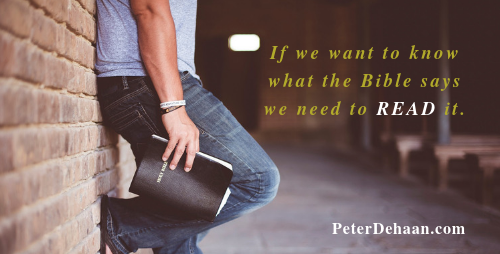 After all, theologians stand in stark opposition to one another on what the Bible means, so we have a very real chance of picking up the wrong book to teach us about the Bible. If we want to know what the Bible says we need to simply read it and not scour some secondary source. I extend this same errant thinking to Sunday morning where trained clergy teach us about the Bible, spending the majority of their lecture sharing what they think the Bible says (and what other people think the Bible says). Why not just read the Bible together to learn what is in it? To know what the Bible says we need to simply read it and not study secondary sources. Click To TweetIn the past, when the laity was illiterate and didn’t have access to the scriptures in their language, it made practical sense for the clergy to teach what the Bible said. Never mind that throughout history trained ministers have consistently led their people astray. If you disagree with this assessment, then why are there 42,000 Protestant denominations in the world today? Why did we need the Protestant Reformation? We needed it to correct wrong teaching. Surely there is much disagreement among our learned leaders over what the Bible says. Today we are literate. We have access to the Bible in multiple versions, both in print and online. And if we follow Jesus, we have the Holy Spirit to guide us as we study the Bible. We don’t need a human guide to tell us about God; we have God and his Word to tell us about God. Yet I write about God and the Bible. Do I consider myself an exception? Certainly not. My goal in writing about the Bible is to encourage others to delve into it themselves, to read it, study it, and seek Holy Spirit guidance as to what the Bible means. (My website ABibleADay.com focuses on this.) I seldom cite secondary sources. I don’t hold myself up to be an expert. I share my journey and encourage others to do the same. Paul affirmed the Jews in Berea as having noble character, for they studied the Bible daily to make sure that what Paul said was true (Acts 17:11). We must do the same. In lieu of listening to a sermon, how can we better use that time to learn about God? Who do you rely on to teach you about the Bible, man or God?